Re-engagement of retired railway employees in exigencies of services - regarding : RBE No. 150/2017; GOVERNMENT OF INDIA, MINISTRY OF RAILWAYS, (RAILWAY BOARD), RBE No. 150/2017, NO- 5 (NG)-II/2007/RC-4/CORE/1, New Delhi, Dated: 16/10/2017., The General Manager (P), All Indian Railways, (As per standard mailing list). Sub: Re-engagement of retired employees in exigencies of services. Ref: i) Board’s letter No. E(NG)II/2010/RC-4/6 dated 27.09.2012 (RBE No. 109/2012) & 14.09.2017, ii) No. E(NG)II/2007/RC-4/Core/1 dated 11.12.2009 (RBE No. 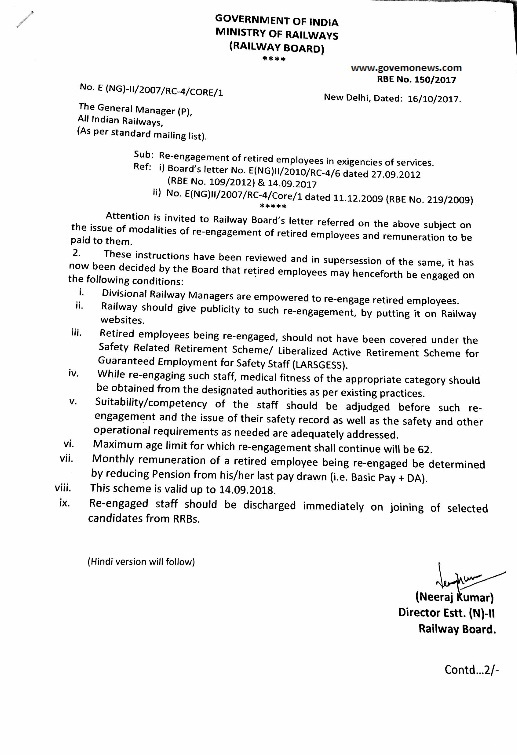 219/2009), Attention is invited to Railway Board's letter referred on the above subject on the issue of modalities of re-engagement of retired employees and remuneration to be paid to them. Attention is invited to Railway Board's letter referred on the above subject on the issue of modalities of re-engagement of retired employees and remuneration to be paid to them. i. Divisional Railway Managers are empowered to re-engage retired employees. ii. Railway should give publicity to such re-engagement, by putting it on Railway websites. iii. Retired employees being re-engaged, should not have been covered under the Safety Related Retirement Scheme/ Liberalized Active Retirement Scheme for Guaranteed Employment for Safety Staff (LARSGESS). iv. While re-engaging such staff, medical fitness of the appropriate category should be obtained from the designated authorities as per existing practices. v. Suitability/competency of the staff should be adjudged before such re-engagement and the issue of their safety record as well as the safety and other operational requirements as needed are adequately addressed. vi. Maximum age limit for which re-engagement shall continue will be 62.
vii. Monthly remuneration of a retired employee being re-engaged be determined by reducing Pension from his/her last pay drawn (i.e. Basic Pay + DA). viii. This scheme is valid up to 14.09.2018.
ix. Re-engaged staff should be discharged immediately on joining of selected candidates from RRBs.